« Stir Up Some Fun With Spring Colored Whisks! It was springtime last year and I was on the hunt for things that reminded me of spring to use with Andrew’s My Obstacle Courses. I was in our grocery store, (which is a great place to find fun, thematic materials- especially in the “holiday” aisle and the shelves at the end of the aisle), and my eye caught a package of colored mini-marshmallows. They appealed to me because of their pastel colors, they could be used with tweezers for fine motor skill building and also because there were so many of them, which means that they make great math manipulatives (patterning, counting, sorting, graphing, use with dice for addition and subtraction, grouping for multiplication and division, etc.). For this post, I thought I would share a sorting station we did and the question cards we used after. There were four different colors of marshmallows so I divided a sheet of regular white printer paper into four sections, writing the color word in each. 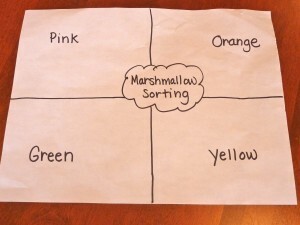 I also labeled it “Marshmallow Sorting” because I like things like this to have a title :). You could place this inside of a sheet protector so it stays in better shape than mine! I typed and printed out some questions for after they were sorted, cut them into question cards and put them into one of my small, spring colored pails. It seems like these cards would be unnecessary since I could just ask him the questions, but for us it makes all the difference in the world when he sees it written out on paper. It’s official My Obstacle Course business for him and not just another pestering question coming from mom. I poured some marshmallows into one of my colored muffin cups and the station was ready! When he got to the station, he read the directions, “Sort the marshmallows by color.” He squished them a little bit, smelled them a little bit (which made me realize that he probably hadn’t had much marshmallow exposure before, particularly since my husband and I don’t ever have them around!) and then sorted them. He likes to sort one color at a time but I know other children who sort as they remove items. Interesting to watch! Once he was done sorting, we looked at the question cards and answered them. You can choose how many questions your child answers or have them “close their eyes and pick” to add some mystery. 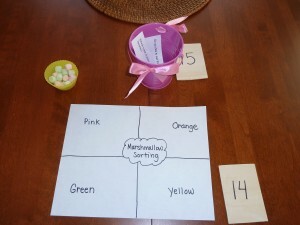 Here are some questions I wrote out to go with this station: marshmallow sorting questions. I like to incorporate math language in the questions as well ask some questions about personal preferences.